Today; 15 February 2018, H.E. Yahya bin Said bin Abdullah Al-Jabri, The Chairman of the Board of Directors of the Special Economic Zone Authority at Duqm (SEZAD) signed an agreement for the construction of the two ways (1) & (5) in the Special Economic Zone at Duqm with a cost estimated at RO. 38.8 Million and another agreement to undertake the detailed design works and construction of the service road from Duqm Refinery to the bulk liquid products dock with a total cost of RO. 9.6 million. The First project was entrusted and awarded to Khalid bin Ahmed and Sons Company and it is expected to be completed within a period of 27 months as of the date of award while the other project was awarded to Qurum Projects and Maintenance Company in collaboration with Patel Company and expected to be completed within a period of 548 days. The Implementation of the two projects comes in support of the Authority's efforts exerted for completion of the infrastructure serving the Special Economic Zone in Duqm. 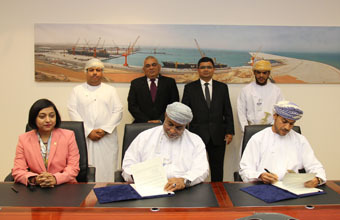 The project undertaken for the construction of the two ways (1) & (5) is deemed as one of the vital projects for the Special Economic Zone in Duqm since they serve as a bridge between Duqm Port Area and the refinery and other strategic projects which will be implemented in the period ahead at the Heavy Industries Area and the new projects contribute to the empowerment of Duqm Port and Duqm Refinery perform their mandated tasks and duties in the process of the economic development. Way no. (1) is considered a stretch for the currently existing road which was implemented in the course of Duqm Port 1st Package Project (IP1) as it begins where the existing road ends nearby the crossroads leading to Oman Dry Dock Company and ends at the main road (i.e. Sultan Said bin Taimour Way) whereas Way No. (5) stretches from the existing crossroads connecting both ways (1) & (6) and ends at Duqm Port Bulk Liquid Petroleum Products Loading Dock. Pursuant to the above said agreement, both ways (1) & (5) will be connected to Sultan Said bin Taimour Road via the construction of a 1.62 KM long Dual Carriageway..
Road No. (1) is 3.93 KM long and it is a dual carriageway of two routes whereas Road No. (5) is about 3.3 KM long and it is also a dual carriageway and it will be equipped with LED lighting system. The said agreement has also provided for the construction of two 6.7 KM long service roads including the Soil Improvement Works and the Water Drainage System. The project for construction of Duqm Refinery Service Corridor is one of the key projects that should be implemented for the completion of the refinery which is one of the greatest investments in Duqm. The project works cover the following: the Establishment of a Service Corridor for the transportation of the Refinery Petroleum Derivatives and its peripherals such as cables, roads and the required protection fences. The service corridor stretches from the location of Duqm Refinery till the Export Jetty at Duqm Port with a length of 6.5 KM and Width of 37.2 M and other checkpoints as per the design. The project includes all the works required for preparation of the corridor to extend the export pipelines and their peripherals in terms of soil rehabilitation and maintaining the engineering levels as per the designs and technical specifications. The project also includes the construction of roads along the corridor and implementation of bridges to extend the pipelines as the route crosses valleys and channels, the matter that requires the construction of upper passages for the pipes to avoid any obstacles that would impede the transfer of petroleum products for export purposes. Moreover, the project also includes the construction of a protection fence of the same length on both sides to protect the pipelines against vandalism.